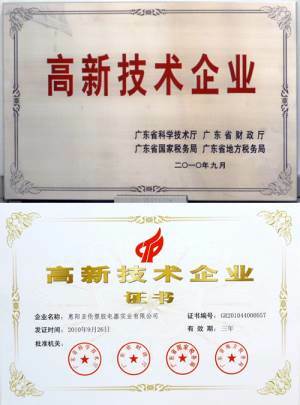 In September, 2010, Huiyang Allan Plastic & Electric Industries Co., Ltd, the subsidiary company of Allan International Holdings Ltd., was honored with National “High-Tech Enterprises” which makes Allan one of eight companies that earned this honor in 2010. This represents a major step forward in Allan’s commitment to research and development, and technological innovation. This honour was granted after several rounds of auditing and verification in different levels. We made application to the local government firstly, and then the Experts Panel organized by High-tech Enterprises Verification Leading Panel of Guangdong Province discussed and on-site audited some companies and then submitted to National High-tech Enterprises Verification Leading Panel for confirmation and approval. This honour has not only been the recognition of the overall strength of our company by the relevant departments either in the national or industry level, but also improved company's image. Huiyang Allan Plastic & Electric Industries Co., Ltd will enjoy the national tax preferential rate and policy support under this certification. Allan will fully take advantages of high-tech enterprises and play this exemplary and leading role, build a new technological innovation system by increasing more Research & Development investment, expanding the external cooperation, cultivating the talent team, enrich the development potential of innovation and enhance the core competitiveness.